ATN NVWSNAR220 Night Arrow 2-2 Night Vision Weapon Sight FREE SHIPPING! The Night Arrow 2-2 from ATN is a second-generation night vision weapon sight intended to provide rapid target acquisition and pinpoint accuracy for tactical or hunting use. The lightweight frame is matte-colored and non-reflective on all non-optical surfaces to maximize discretion. It attaches to ordinary Weaver rails, guaranteeing compatibility with a wide range of firearms. Its red-on-green reticle provides high contrast against all backgrounds for accurate low-light aiming and both windage and elevation settings are finely adjustable. The high-quality optics and intensifier provide a clear, high-contrast image for superior visibility. The sight integrates ATN's automatic brightness adjustment and bright light cut-off systems to produce a consistent image and protect the tube. When ambient light levels reach zero, the detachable infrared illuminator takes over to maintain visibility and track subjects in compete darkness. 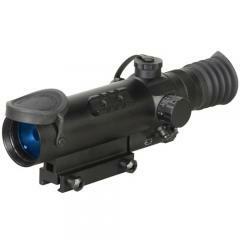 ©2002-2019 CopsPlus.com: ATN NVWSNAR220 Night Arrow 2-2 Night Vision Weapon Sight FREE SHIPPING!